SAW 15CII from is a lightweight, portable wheel load weigher (SAW scale) used to determine wheel loads of up to 15,000 kg. SAW scales have applications in enforcement of commercial vehicle weights in road transport, construction, agriculture, forestry and waste disposal industries. The SAW 15CII is EC approved with OIML and CE certificates of conformity. It is made with high-quality, corrosion proof materials, and is built for a long service life in portable enforcement applications. The integrated batteries allow independent operation. The SAW 15CII is easy to operate and its large, backlit LCD display is easy to read. 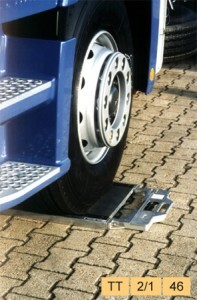 Two SAW scales can be connected together by using a UniMux multiplexer to form a static axle load scale. Air inflated tyres do not cause any damage when they pass over it. Access ramps are available as optional accessories. The SAW 15CII records and gives printouts of wheel loads, axle loads, multi axle loads, gross weight, overload in percent and absolute terms, and other related data. The product is powered by six rechargeable batteries which ensure about 10 hours of continuous operation.